Hey guys! So I'm super excited for this post because it's Brazen and Brunette's first guest post! My plan is to feature lots of guest writers on my blog so you can get several different perspectives on law school. 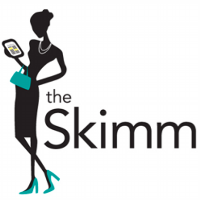 Today I'm featuring one of my amazing readers! She contacted me a few months ago using the questions and suggestions form (this post was actually a suggestion of hers) and we've been talking ever since. So naturally when she told me that she was starting her law school journey early, I just had to ask her to write about her experience. If you have a great law school experience you'd like to share, use that same contact form (on the bottom right) and let me know! Firstly, I must say that Nikki is one of my favorite bloggers and she has done an excellent job of sharing her journey as a 1L. 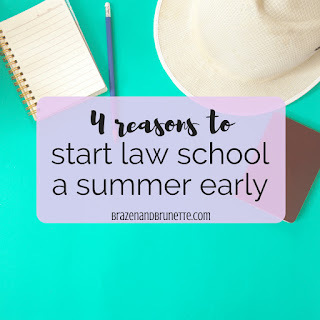 I started my 1L year at the end of June and Nikki has asked me to share a little about why I decided to start law school early and some of the benefits of doing so. Below I have listed few reasons why I decided to participate in my school’s summer start program. All I ask is that you all remember everyone’s law school experience will be different. What is the summer start program for law school? At the school I attend they offered a summer start program where we could start our fall classes early. This is the first year that my school has done this so this whole program was very new to everyone involved. During the Summer Start Initiative (SSI), we received instruction on the four major doctrinal first-year classes: Torts, Contracts, Civil Procedure, and Property. We also had one Critical Thinking class and several exam-taking, note-taking, outlining, and essay-writing workshops hosted by our professors. How much time did you have to get ready between class and graduation? I graduated in December of 2015 and started law school in June 2016, so I had six months to get ready for law school. Every school is different when it comes to terms of what exactly you have to do to get ready. When I was preparing I definitely found that Nikki’s posts about what she did in the days leading up to orientation were very helpful. I highly suggest any 0L go take a look at those posts. Why did you decide to start early? What are the benefits of starting early? You won’t be as nervous about the infamous 1L fall semester. There tends to be a lot of apprehension around starting your first year of law school. I know a lot this fear comes from the horror stories that current law students tell us and I also know a lot of it may come from what we see in the media about 1L year (example: The Paper Chase), but starting early, starting a little slower, and starting with less people around can help dispel this apprehension. You may even come to realize that it really isn’t as bad as you were making it out to be in your head. You’ll get to know your professors. I used the summer semester to learn what makes my professors tick. What is their teaching style? What do they want to see on the exams? What do they not want to see on the exams? What questions about the cases do they always ask in class? For instance, I have one professor who always asks questions from the notes after the cases and the footnotes in the cases. She loves that stuff! I also took this time to ask myself how I should be briefing to prepare for class for that particular professor. You’ll get to know yourself better…. earlier! You’ll get to establish a routine before the crazy kicks in. During the summer, campus is relatively calm and peaceful, at least at my school it is. Because there were not a lot of people, it made it easier for me to figure out the quickest route to school, the best place to park, where my classes were, and the place where I like to study. Granted, this may change when everyone else returns to campus, but at least with starting early, I have some idea of how I would like for my fall routine to look. Is the class load the same as if you started later? The class load is not the same as if I started later. Because the section I’m in started earlier, we have more time to cover the fall semester material. This being said, we have the “luxury” of moving at a slower pace. This doesn’t make the it any easier, but it does give us more time to process the complex material that we are covering class. For example, we have reading assigned for every night, but because we aren’t covering as much each day as we would in the fall. The professor can discuss a certain topic in class, I can go home and study my notes from class or add that concept to my outline, and then have a really thorough understanding of the concept. Whereas in the fall, I would probably have to skimp on some reviewing due to the time crunch. Lastly, I want to suggest a really great book I read in preparation for law school. It’s called 1L of a Ride by AndrewJ. McClurg, a law professor. Go check it out because it is definitely worth a read! And start acting like it. I love this entire blog! When I came across it I was so apprehensive about starting my 1L year but it has definitely calmed some of those nerves. And this post specifically is near and dear to my heart because I too am doing the summer prep course at my school. The program is so beneficial and I would recommend it to anyone who is apprehensive. Hey! Can you email me at Josh27844@gmail.com. I am going to do the SSI and would like to learn more about it.